I had a coffee with my friend Philip. 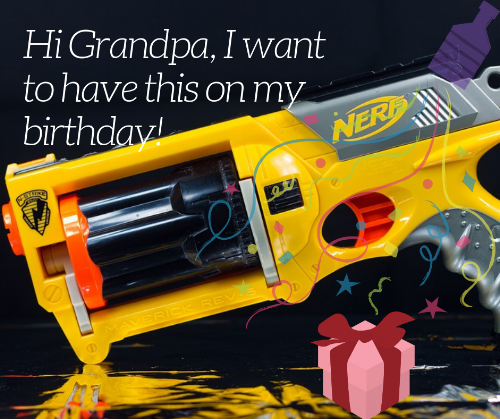 Something that came up in our conversation was that he started searching for Nerf guns for his sons. Nerf guns are toy guns that shoot “harmless” foam bullets. It’s quite a cool toy. We spoke about the power of knowledge, and how marketers are using our search terms and info to showcase products that we’re looking for. That’s called “remarketing”. They will place ads on google, Facebook and websites that you are visiting to draw your attention to their offer for your needs. I did my own study into Nerf guns and found that these marketers missed the mark completely. You see - understanding where the future of business is heading towards - it’s engaging more on a personal and 1-1 level. Some of these ads read…”Buy the best Nerf guns delivered to your door”, “ Buy now and save 25%”, and fluffy marketing jargon like that. Well, here’s why they missed the mark: they didn’t communicate on a personal level with Philip. Google knows that Philip is 42 years old, knows he’s a male, where he stays, and some other things about him. When we look at Facebook, they even know more about us. I’m almost sure they know what the size of my shoes are. So if we look at what they know and we look at where the future is heading, we need to use this information to be more personal, real and to connect on an emotional level with Philip. You see…. we want to connect with the person on their level... and we want to connect with Philip emotionally. I call that “marketing to the audience of one”. Let’s make this practical. The tool you can use to possibly be more effective with any of your campaigns, whether it’s online or offline, is basically two steps. The first one is you need to profile your “Philip”. And then once you profiled that audience, learn to communicate personally and directly them. Learn how to change your marketing into a personal engagement.